Cardijn Community Australia (CCA) is organising a Conference on the theme: CARDIJN IN AUSTRALIA: PLANNING FOR THE FUTURE from the 4th to 6th November 2011 at Melbourne. CCI-India is organising a Study Session on the 11th and 12th November 2011 at Pastoral Centre, Santhome, Chennai on the most debated topic 'Corruption'. But this study session will not just talk about corruption at one level but will analyse corruption beginning from our own lives and what is prevalent in society. The entire exercise will be done based on SEE JUDE ACT method. At the end of the Study, the delegates from different parts of India will come out with a 'Declaration' demanding elimination of corruption at all levels. Following the Study, CCI-India General Assembly will meet on the 13th November 2011. The General Assembly will review the work done in the past year and will plan perspectives for the future. The salient feature of the GA will be the adoption of a Statutes for CCI-India and the launch of Vatican II @ 50 - a three year project to review the implementation of the spirit and decisions of Vatican II particularly with regard to lay participation and social commitment of the Church. Liby, wife of Dominic Mendonca, CCI-India Collaborator is critically ill in a Pune hospital since 13th October. Liby is on ventilator since then. Please pray for Liby's speedy recovery. 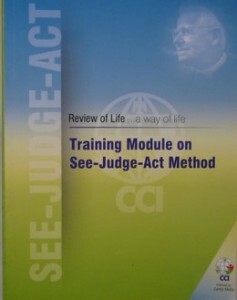 CCI India has come out with a training module on See-Judge-Act method which is the first of its kind at the international level. Titled 'REVIEW OF LIFE - a way of life' this module is for universal application by any group involved in social change, spirituality and community development. The module published by CARDIJN MEDIA was released at the General Assembly of the CCI held in July this year in Bangkok.